Tasha has an amazing, intuitive feel of the horses she works on. Her ability to read their responses to her touch truly enhances her ability to achieve full body relaxation and muscle release. 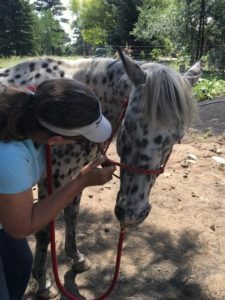 I’ve used many equine body workers in my 25+ years as a horse trainer, and I put her at the top of my list for her ability to improve the horse’s total well being. Every horse she worked on at my facility improved in self-carriage and relaxation under saddle. When I am choosing a practitioner to work on my own horses I want someone who excels at “reading” horses, is sensitive to their responses, and allows them to feel safe and be able to trust and relax with the protocol. Tasha excels in all these areas. She is patient and gentle and is attuned to the responses of the horse. I have seen her work on several horses with difficult problems and she was effective in helping them all be more comfortable, and some even had a remarkable immediate transformation in the way their body moved and their gaits.